The river is flowing at 35 CFS and is 55 degrees at Falls Rd. Fishing has been productive throughout the day. Ants and caddis have been go-to patterns in the mornings and afternoons, while small midge and pheasant-tail nymphs have been working during mid-day. Tricos have just started coming off and the fish will begin eating them in the next week. A long leader ending in 7X has been the key to fooling the wary fish in low water. 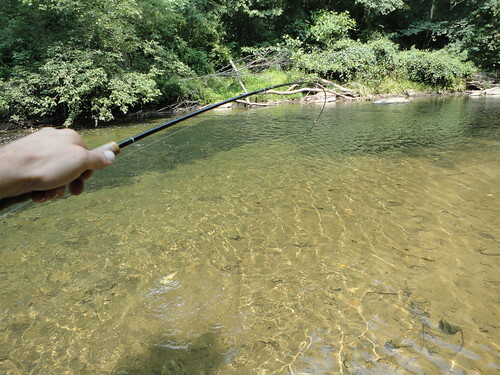 Fishing the upper sections of the river is a good idea if you want to fish pocket water and deep pools. Stop in and pick up some caddis and terrestrials from the muffin tins before you head out. This entry was posted in fishing report on July 28, 2011 by Max Meneveau. Please join us for a flyfishing school. 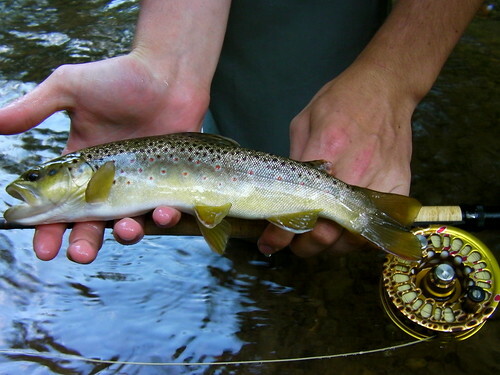 On Sunday, July 31 a Backwater Angler Guide will be teaching a fly fishing school that is ideal for beginners. If you’re planning on fly fishing in Maryland, or anywhere else for that matter, this course is a great introduction to the sport. The school covers knots, casting, gear, fly selection and an hour of on-stream instruction. Schools are held in a meadow overlooking the Gunpowder river by a Maryland state licensed and insured fishing guide. Class is held from 11:00 AM till 2:00 PM. Cost is $100 per person and includes the use of gear. A Maryland non-tidal fishing license and trout stamp is required and may be purchased prior to the class with check or cash at the shop. Class size is limited to 4 and pre-payment is required. Please give us a call at 410-357-9557 or drop us a line at info@backwaterangler.com to register. This entry was posted in events on July 28, 2011 by Theaux Le Gardeur. The river is low at 34 CFs, clear and 58 to 61F by mid-afternoon. Look for active fish in riffles and shade lines and stop by the shop and give the muffin tins a once over-we have plenty of terrestrials and caddis on the counter and are always happy to lend a hand in suggesting the most productive access points along the river. The Gunpowder is at 34 CFS and fishing at this level has its advantages. Fish will be stacked in deeper pools and riffles, making it easy to see and target individual fish. Use a long 12-15 foot leader ending in 6X or 7X. 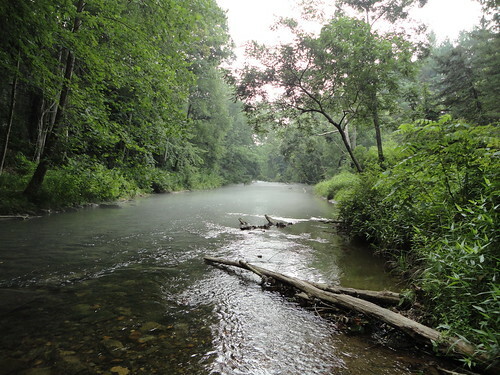 Summer on the Gunpowder river is one of the most fun times of the year to fish. 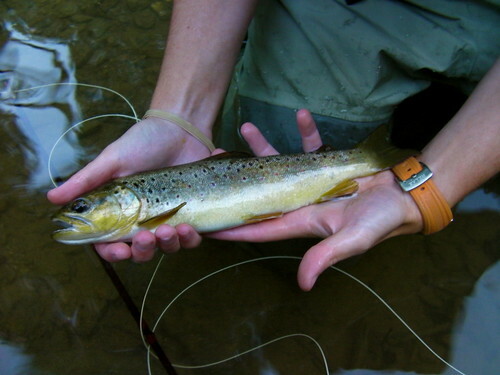 You can throw a variety of different dry flies such as; Elk Hair Caddis, BWOs, Sulfurs, Hoppers, Ants, and Beetles–even larger attractor patterns can draw fish. The past four days we were able to fish, each night we had large numbers of tan caddis in a size #16. Also, try fishing BWOs in sizes #14-18 and Sulfurs in a size #16. What I found was the fish targeted in on the caddis and small terrestrials such as an ant. Be sure to be stealthy, “if you can see the fish, they can see you”, stay low, and make few false casts. Tricos have been seen buzzing up and down the river, while the fish have only started to eat them, fishing will be heating up as we approach the weekend. A good pattern to use for Tricos is a reverse hackle pattern in a size #22-24. If you can take anytime to fish in the next few days, there have been great caddis hatches anywhere upstream of Big Falls Road. The fish above fell for a size #16 tan caddis while the fish below fell for a size 14 “Acid Ant”. 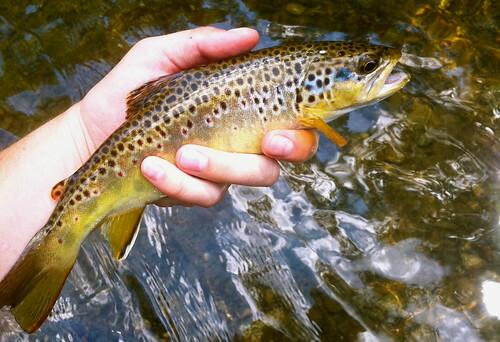 This entry was posted in fishing report on July 18, 2011 by Theaux Le Gardeur.